Adobe's Flash Player is one of the most widely used application for delivering audio, video, and animation on the Internet. But the Flash player for iPhone is conspicuously absent, which has been a source of criticism of the iPhone since its launch. Since many iPhone users have expressed frustration at the inability of the iPhone’s to view flash, especially flash video, this tutorial will show you how to view flash video without any issues — make use of specific browser to play flash video on iPhone, download iPhone flash player apps, or convert Flash video to iPhone compatible videos. Fortunately, the app store has quite a lot of apps that let you watch flash video on iPhone without any issues. Here are some Adobe Flash Player alternatives which may bring you the convenience on playing flash video files with iPhone. The Puffin Web Browser supports the latest Adobe Flash engine over the Cloud for iPhone, iPad and Android devices. It features download- to-cloud, theater modes for flash games and videos, new Color Themes, brand new User Interface, and Add-ons supports. With Puffin like an Adobe Flash Player for iPhone, you can play any flash videos or games online smoothly. Photon Flash Web Browser for iPhone is designed to enhance viewing experience on your iPhone series. It features flash browsing support (e.g. play flash games such as free Facebook games), anonymous browsing, brightness control, play music that streams through a flash player. When using Photon Flash Web Browser, please remember to click the "lightning bolt button" to enter the Flash browsing mode, or you will be still in the native mode for normal websites. Cloud Browse is a web browser for Flash and Java. It allows you to access Flash and Java content such as games, videos and other media contents on the web via your iPhone, iPad, or iPod. It also supports iOS disabled content. Cloud Browse works lightening fast, but the Flash playback is a bit slow and sometimes video and audio can't be synchronized. VLC Media Player is a simple, fast and powerful Adobe Flash player for iPhone/iPad. It is the most popular video player among many people. You can run it on all iOS or Android devices, and even Windows, Linux, and Mac OS X. It supports various codecs like DivX or H.264, and different video formats like FLV, avi, mkv, mp4, wmv, and more. RockPlayer2 is a high quality, fluent, multiple formats media player, with gesture control, srt subtitle, audio track selecting, RockShare file sharing, AirPlay, Customizable play control bar and more. It can be used to play Flash video MKV, AVI, RMVB, FLV and more on iOS devices. Of course, there many other video players out there that allows you to enjoy flash videos on your iPhone, or iPad, iPod. Just get the one you like. Besides using specific browser to play flash video on iPhone or installing third-party video apps, there is another way to play flash video on iPhone. Well, you can make use of a Flsh video converter: Pavtube Video Converter Ultimate for Windows / Mac (Review) to convert flash video to iPhone videos for offline playback. It is a powerful application covers the functions like audio/video to iPhone conversion, Blu-ray (Blu-ray discs, Blu-ray ISO images, Blu-ray folders) and DVD (DVDs, DVD folders, DVD IFO files, DVD ISO images) conversion, 2D/3D-to 3D conversion, editing original video sources (e.g. trim, crop, add watermark, insert subtitle, add special effects, split video into several, merge videos into one file), batch conversion, adjust audio and video settings for better viewing experience, etc. No matter which device you have, you can move every piece of digital files (including flash videos) into it. Launch the software, then click "File" on the screen. Choose "Add video/audio" or "Add from Folder" to browse and import Flash video from the local drive of your computer. Click "Format" bar, from its drop-down list, navigate to "iPhone", from its extended list, select the specific iPhone preset profile format according to your iPhone model. You can select to output "HD Video" > "H.264 HD Video(*.mp4)" or "H.264 HD Video(*.mov)" from "Format" drop-down list. Back to the main interface, click "Settings". 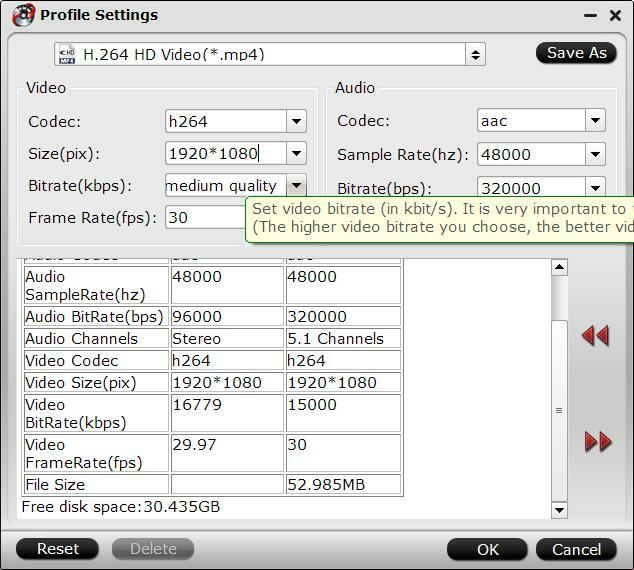 There you could adjust the video and audio parameters of output iPhone file, including video codec, bit rate, frame rate, resolution, audio codec, audio bit rate, audio sample rate, channel, etc. 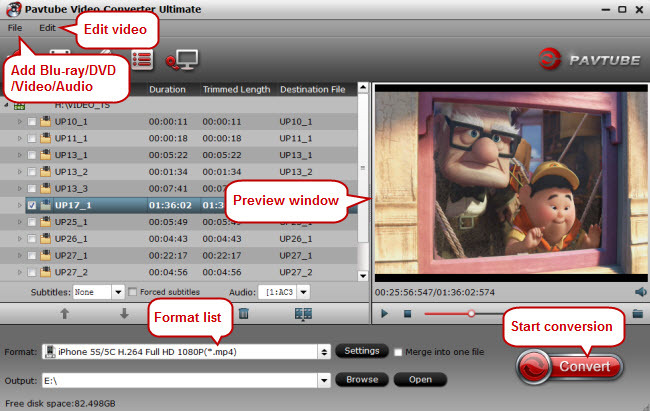 Go back the main interface and choose the big red "Convert" button to start flash video to iPhone conversion process. Just wait for the process to finish. After that, you can get the converted flash videos to play on your iPhone without any obstacle. How to Play 4K videos on new iPad (2017)?